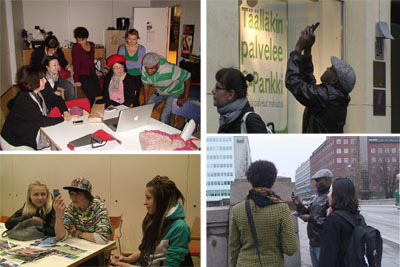 The 'RealUbi' research partner project (2009 - 2011) of Media Lab at Aalto University School of Art and Design was funded by Tekes, the Finnish Funding Agency for Technology and Innovation. It was part of a larger research project of the multidisciplinary UBI ('UrBan Interactions') research program of University of Oulu (http://www.ubioulu.fi). The UrBan Interactions' program brings together researchers from engineering, computer science, architecture, business, art, economics, design and cultural anthropology. In collaboration with the City of Oulu it has built a functional prototype of a future ubiquitous city in Oulu, Finland. It is furnished with new pervasive computing infrastructure at downtown Oulu in form of interactive public displays, large-scale projectors, and different wireless networks including a city-wide WiFi network providing open and free Internet access to general public. The unique infrastructure of ubiquitous technology enables new type of interaction between the citizens and technology. Ubiquitous city stands for an urban space in which information technology is being harnessed invisibly and effectively for the use of processes taking place in the space. The objective is to create an urban environment in which better services are being offered to the people of the city. The additional value produced by the infrastructure and services for the users of the urban space is being studied systematically by collecting quantitative and qualitative data with different methods. Within the context of the UrBan Interactions program, the RealUbi partner project of Media Lab focused in particular on generating new knowledge that informs future design of multi-modal interfaces in urban spaces. This concerned applications, devices, models, techniques and services for urban interaction. With a technology driven exploration approach and an iterative rapid prototyping process we designed and explored applications such as creative applications for enabling artistic creations, fostering togetherness, urban communities and an art inspired lifestyle. The project produced a series of outcomes in form of scientific publications, workshops, artistic works, videos and presentations. Díaz, Lily & Ekman, Ulrik (2011). “Mobile Ubiquity in Public and Private Spaces”, Special Issue of Digital Creativity, Taylor Francis, Vol. 22. No. 3. Scheible J. (2010). 'Multimodal art tools for creating and sharing interactive engaging experiences', In: Selke S & Dittler U (eds.) Postmediale Wirklichkeiten aus interdisziplinärer Perspektive. Heise Zeitschriften Verlag, Hannover, Germany, 2010, 223-238. 14.5.-4.6.2010, Lume Galleria Helsinki, ‘Paint my city’ MobiSpray art work exhibition, Jürgen Scheible (in conjunction with doctoral defence event). Interactive snow sculpture painting, CHI EA '11 accepted video. Life Breather is a tool to make static objects in the physical environment talk and become ‘alive' while interacting with them. Through this, the objects obtain a human voice and can speak for the purpose of telling a story. The story is not a pre-made story done by cultural heritage experts or artists; it is a recording of the thoughts that are triggered in a persons mind at the moment when she looks at the object. Often when looking at an object in a museum or a statue outdoors, it triggers some thoughts in our head. These thoughts might be related to our previous knowledge about the object, some experience or own cultural understandings or maybe just fantasy and fiction. The important issue here is, that the story gets told and recorded from the object’s point of view. In this way it is like one are breathing life into the object. The Life Breather tool is a mobile phone application which works in such a way that you take first a photo of the object. After that the photo shows on the phone screen and the voice recording starts automatically, giving you 15 seconds time to tell the story by speaking into the phone’s microphone. A timer is shown on the phone screen to know when the recording has stopped automatically. The result of each recording is a clip that contains an image and sound clip. All clips are stored locally on the phone and can be accessed and played through gallery functionality. Additionally to the recorded clips there is other metadata collected such as the time of the recording and its geolocation in form of GPS coordinates. Once a series of clips is recorded they can be ‘stitched’ into one film, ready for an audience to view for the purpose of revisiting the moments when objects were made alive. All clips that have been collected locally on the mobile device are uploaded via Wireless Lan to a server that automates the film-making. 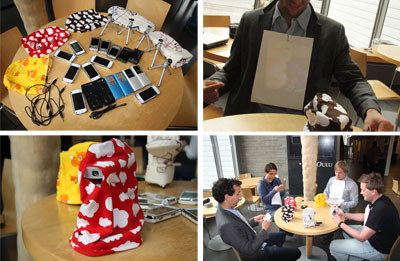 The film can contain the clips of multiple phones – turning it into a collectively created movie. This sub project brought together diverse areas of knowledge including information design, interaction design, multimodal interface design, mobile computing research and development, concepts from digital cultural heritage and performance art in order to create a collectively realized experimental movie. Information design techniques for example, were used to create maps that were distributed to test-participants. Life Breather was tested in the city of Helsinki following a journey designed for a group of users to engage and express themselves and their interaction with Cultural Hertage artifacts. MA students Chao An, Anukka Salo and visiting scholar Jiayu Wu, prepared maps before the test event. The maps contained descriptions of an exploration path to be followed by the participants as well as illustrations of pre-identified artifacts or cultural artifacts found on these journeys. The graffiti dance installation project was a collaboration project between Jürgen Scheible of Aalto University and David Shamma of Yahoo Research! in California as well as Renata Sheppard of University of Illinois at Urbana-Champaign. Graffiti Dance is based on Jürgen Scheible's MobiSpray application. Graffiti Dance allows the audience to graffiti paint with light onto a buildings side and receive immediate local feedback from a set of dancers choreographed to respond to the movement on the public display. The installation is a holistic experience using a plurality of sources (syndicated news Images and Twitter) and local influences (from mobile uploads) that reflect our understanding of the world around us, how we speak out in public forums, and how we interpret the creative act. This sub project explored the use of mobile pico-projectors for creating and sharing artistic activities in public space. 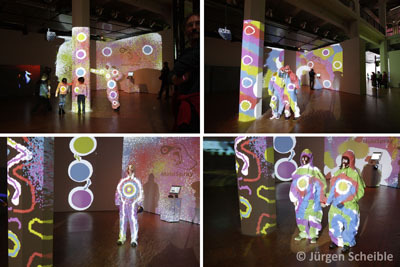 An application was designed and programmed which connected 8 pico projectors and 8 mobile phones into a real-time streetart platform. The project was realized during the international Ubi Summer school of University of Oulu in Summer 2010.